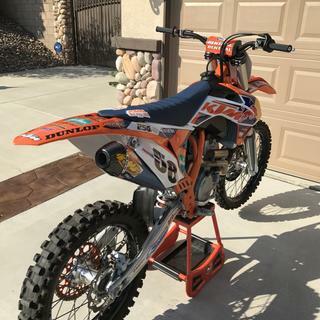 Don’t just leave this cover to the pros - the KTM Factory Seat Cover is a great addition to your bike to keep your seat looking great ride after ride. 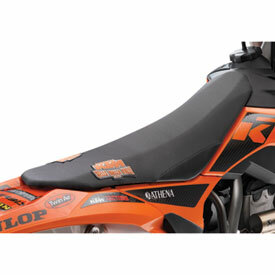 Try the KTM Factory Seat Cover for yourself now! For standard height seats only. If you are having issues sliding around on your seat this is the cover for you. I was having issues sliding around on the seat but those days are gone. This cover is just short of being Velcro you stay exactly where you want to with no movement. There's a reason the factory teams use the same cover. a low seat and it fits very well. Only squawk is that it developed a bunch of little rips/cracks around the edges after about a year. You can't even see them from far away, but they let the seat foam get wet and break down. I recommend it for looks and function, but for 70 bucks, I would have hoped it would hold up better. My advice is to stretch it about 1” further lengthwise than you think you should. Mine ended up with a few wrinkles because I thought it would fit like the factory cover and not need trimming. Great grip and you cant beat the look either! If your bum gets sore from the stock KTM seat then this cover will hurt. It is not designed for long term sitting. But if super grip is what you want, then this is your seat cover. Looks awesome has a ton of grip, looking forward to trying it out! Highly recommended, looks trick and is of high quality. The seat is completely perfect and very easy to install. I put it over the old one looks like it came from the factory. The price makes it even better. The seat cover went on no problem, I was able to put it on right over the existing one without removing it and stapled it on. I've had it about 2 years and still looks awesome and no rips or tears yet. I would recommend this seat cover to anyone. 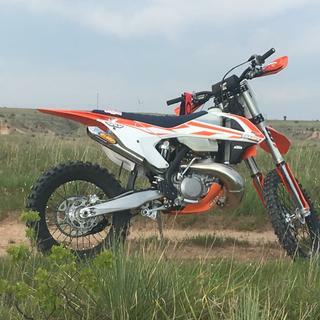 Upgraded the 2017 KTM 350 XCF. The factory seat, had me sliding all over, actually lost control of the bike doing hill climb and wrecked pretty gnarly, thats what inspired this purchase. 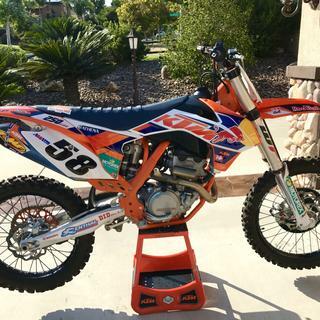 All i can say is NIGHT AND DAY difference, if you're looking for some extra seat grip, and you rid KTM, this would be my rec all day long! I bought both types of seat. first was black with leather side. grip was a 8 out of 10 but sides cracked after about 4 races. blue seat was a 10 out of 10 on grip. but the stitching breaks and ribs on seat just flap. grip was so good I'll probably buy the seat again soon. I love this cover so much better than the stock plain black! Looks great with all the blue in my graphics too. Fits on superb, way better traction and grip than the factory cover. Looks awesome!! The part of the seat cover that is at the bottom of the seat that's a different material cracked after 2 races and a handful of practice rides. I bought this cover solely because it's a ktm part and the quality should have been the best. I was wrong. does this come with foam? i am looking for a softer seat. BEST ANSWER: The KTM Factory seat cover does not come with foam. Speaking to the cover itself its one of the best mods I have made to my 2013 XCF 350. I installed the cover as well as the usual day 2 bolt ons IE Bark busters , skid plate and so on. The cover has performed great still looks new and is very gripy . I currently have 365 hr on the bike and ride single track in Steamboat Colorado . I was able to slide it on right over the existing stock seat cover and stapled it on. Worked out great and looks awesome! Foam is not included just the seat cover. However for the money this seat cover GRIPS!! No it doesn't , it's just the black cover. No, it's the seat cover only. No, it is just the cover. No foam. Just the cover. No, it's just the cover. 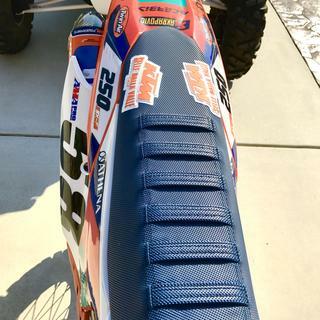 Can this seat cover be made to fit a KTM "low seat" and still look good? Probably not due to the logos inn the rear. In order to keep the cover tight. The logos are really close to the rounded edge.